PIX for Apple TV’s new custom-built video playback solution offers an enhanced video experience and makes it easier to access projects anytime, anywhere in the world. Conveniently access PIX in conference rooms, homes, executive offices, and screening rooms all without the need for custom hardware. Work on your biggest shows, watch new shared material, view messages displayed with content and discover the beauty of collaboration with PIX for Apple TV. Simple log-in and easy access to your project inbox to access shared material. Incorporating many of the favorite features on Apple TV, PIX for Apple TV’s effective video controls allow users the ability to scrub video timelines with thumbnails, skip backward or forward 10 seconds, and view overlay with duration counter. 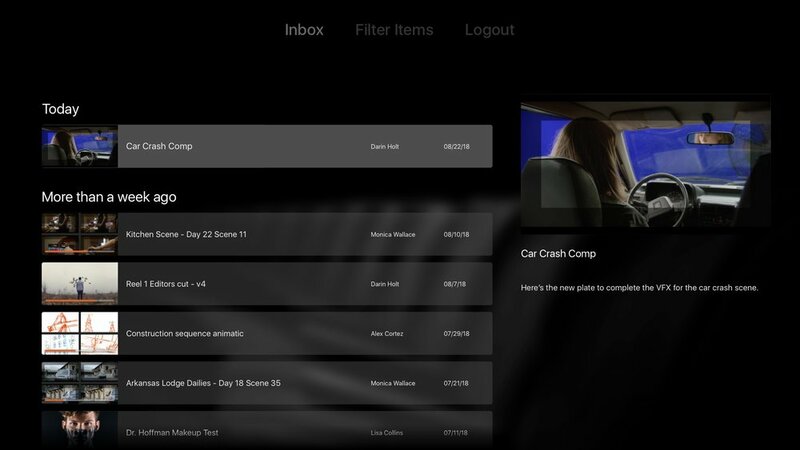 Metadata capture, resume playback and sync progress across devices, user-friendly inbox, custom integrations and integrations leveraging industry tools–all conveniently available on Apple TV. Open the App Store from your Apple TV and select the Search tab. Search for PIX System. Navigate to the PIX app icon and click "Get" to download. Once the app has downloaded, click "Open" to launch PIX. Trouble downloading PIX for Apple TV? Reach out to us at support@pixsystem.com. Please note, the App Store isn't available on Apple TV 3rd Generation or earlier. Interested in learning more? Reach out at sales@pixsystem.com.